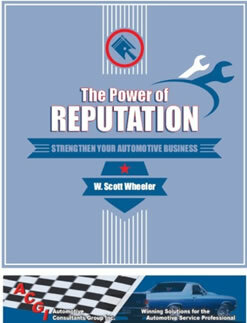 The Power of Reputation | Automotive Consultants Group, Inc. There is a direct linkage between behavior to perception to action. This means that “doing the right thing” is also “the right thing to do for business.” With perhaps the exception of a lawyer, nowhere could this be more true than in the service industries. Certainly in automotive service and repair. There is a direct correlation between perceptions – those met, not met, or exceeded – and the bottom line. Data consistently shows reputation and meeting expectations are key. All of these things are possible when you have a positive reputation. It becomes a major determining factor in choices made when people choose to do business with your shop. More often than not, your good reputation is one of the main reasons they choose to do business with you. Your job, then, as an automotive service and repair professional is to create a reality of service based on values, how to communicate those values, and how to build relationships based on trust. What values do you possess? 3 hours. Can be modified to fit particular time slots.